Courtesy of Chris Morgan, KAATSU Specialist. As open water swimmers, many aquatic adventurers have had a feeling or desire to possess an aquatic “super power”… whether we could breathe underwater, swim faster or speak to watery creatures below the surface. Unfortunately, the reality is, we are just foreigners in the incredible Big Blue of Plane Earth. However, we do have some Super Heroes who have graced our Seas, Lakes and Rivers around the world with incredible feats: Sarah Thomas, Ferry Weertman, Sharon van Rouwendaal, Diana Nyad, Otto Thaning, Lewis Pugh and Lynne Cox are just a few of the individuals who have performed superhuman achievements in their own aquatic environment. What if the Super Heroes of the comic books were to take on these same challenges of our own Open Water Heroes…who would win? Could Aquaman cross the length of Lake Powell? Could he swim across the Gulf Stream from Cuba to Florida? Could Prince Namor the Sub-Mariner endure the frigid waters of the North Pole or win the Olympic 10K Marathon Swim? It would be unfair to match these heroes of fantasy with our real human heroes and heroines of today. But what if Aquaman were to compete against Namor in some kind of virtual swimming event? They could compete to be the first to complete the Oceans Sevens in just one day or reach the Mariana Trench depths, or fastest to swim around the entire planet? Aquaman comes from the world of DC Comics. He was first introduced during the early 1940’s precursor of DC Comics, in a series called More Fun Comics. Aquaman - who is known in more recent DC comics as Arthur Curry 0 was cast out of Atlantis. He is known for having multiple super powers, but the most prominent being his ability to breathe underwater, his skills of communication with all forms of sea life, and his incredible speed of swimming. Prince Namor the Sub-mariner is a Marvel Superhero who is considered by some to be one of the original, if not the first Mutants. He first appeared in 1939 in Marvel Comics first issue. Like Aquaman, he has ties to Atlantis, as he is believed to be the son of a human sea captain and a mythical princess of Atlantis. Not only can Namor breathe underwater and swim at superhuman speeds, but he also has the ability to fly. Even though these two Open Water Super Heroes come from completely different comic book worlds, there has been two times in which these two heroes have had a comic crossover. 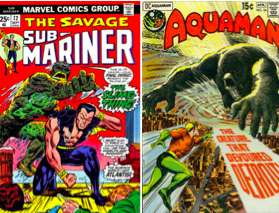 In Aquaman #56 and Sub-Mariner #71, there are references from one to the other which slipped under the radar of the major publishers of DC and Marvel comics. The artists and authors of these stories are historically fans of one another and they often created small hints and secrets which would link the two worlds. Though the real-life human world has never seen a true clash between these two Open Water Originals, it could lead to an infinite debate about who would win in any kind of supernatural Open Water Challenge. But for now, we will rely on our real Open Water heroes to continue to inspire us and expand our mindsets with their remarkable feats of courage perseverance.